Tropical Storm Cindy formed Tuesday in the Gulf of Mexico, hovering south of Louisiana as it churned tides and spun bands of heavy, potentially flooding rain onto the central and eastern Gulf Coast. NEW ORLEANS (AP) — Tropical Storm Cindy formed Tuesday in the Gulf of Mexico, hovering south of Louisiana as it churned tides and spun bands of heavy, potentially flooding rain onto the central and eastern Gulf Coast. Alabama Gov. Kay Ivey issued a state of emergency because of the threat of torrential rains and other severe weather, including dangerous high tides and rip currents. Double red flags snapped in the wind on the public beach at Gulf Shores in her state, warning visitors to stay out of the pounding surf. Workers on Grand Isle, a barrier island community south of New Orleans, worked to reinforce a rock levee protecting the island’s vulnerable west side. Officials there decided against calling an evacuation but said in a statement that anyone who wanted to head for the mainland should do so as early as possible because water might eventually cover low-lying parts of the only route off the island. The Louisiana National Guard dispatched high water vehicles and helicopters into flood-prone areas. The state said the Federal Emergency Management Agency was moving 125,000 meals and 200,000 liters of water into Louisiana. Gov. John Bel Edwards said the advance notice of the storm gave officials time to put emergency plans in place. Louisiana was slammed with major flooding last summer from an unnamed storm that heavily damaged the Baton Rouge and Lafayette regions. Texas Gov. Greg Abbott ordered the State Operations Center on Tuesday to raise its readiness level from level four/normal conditions to level three/increased readiness. He also activated four Texas Task Force 1 boat squads and two Texas Military Department vehicles squads of five vehicles each to respond to any weather-related emergencies. The third tropical storm of 2017, Cindy was moving slowly northwest Tuesday night and expected to reach the northern Gulf Coast late Wednesday and rumble inland Thursday over western Louisiana and eastern Texas. Forecasters warned 6 to 9 inches (15-22 cms) of rain and up to 12 inches (30 cms) in spots was the biggest threat in parts of Texas, Louisiana, Alabama, Mississippi and the Florida Panhandle. Already some flooding was reported on Alabama’s Dauphin Island and flood control locks and gates were being closed along Louisiana’s bayou-marbled coast. Authorities in various coastal Louisiana and Mississippi communities handed out sandbags for areas along rivers and bayous. The National Hurricane Center in Miami said that Tuesday night Cindy was about 230 miles (370 kilometers) south of Morgan City, Louisiana — about 305 miles (491 kilometers) southeast of Galveston, Texas. It had top sustained winds of 60 mph (97 kph). A tropical storm warning was in effect from San Luis Pass, Texas, to the Alabama-Florida line. Rain and tides, rather than wind, were considered the main danger from the system. At a news conference in New Orleans, Mayor Mitch Landrieu urged vigilance as bands of rain from the system swept over the city. Forecasts said the system could dump from a few inches to more than 12 inches (a few centimeters to more than 25 cm), depending on Cindy’s development and path. At worst, the storm could flood neighborhoods outside the city’s levee system and cause flash flooding even in protected areas. “This is going to be a very serious event,” Landrieu said. In coastal Louisiana’s Terrebonne Parish, Kim Chauvin said the shrimp processing businesses she and her husband run helped put out the word Monday that shrimpers should return to port and unload their catch before flood control structures closed. “We call them, we text them, we Facebook them, we Twitter, them. Any way we can get to them,” she said. 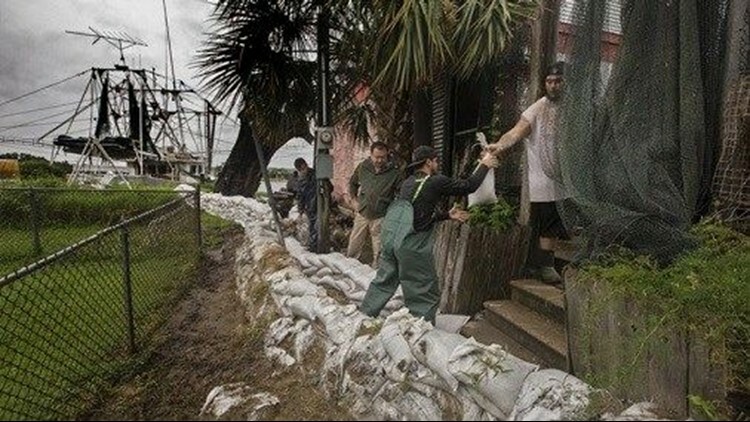 Parishes along the coast made sandbags — or sand and bags — available to people who wanted to protect homes and businesses. At the Escatawpa Hollow Campground in Alabama, near the Mississippi State line, owner Larry Godfrey was prepared for flooding that would add to the woes of a rainy spring. “We’ve had so much rain, we haven’t done any business in about eight weeks because of the rain,” said Godfrey, whose campground typically hosts swimmers and boaters. He said the Escatawpa River, at 15 feet (4.5 meters), would typically be lower than 3 feet (1 meter) at this time of year. While the northern Gulf Coast braced for Cindy, the southern Caribbean region was dealing with the aftermath of Tropical Storm Bret, which unleashed heavy flooding, knocked out power and ripped off several roofs in some areas of Trinidad &Tobago. Bret had degenerated into a tropical wave by Tuesday afternoon..
All airports in Trinidad & Tobago reopened later Tuesday, though public schools and many businesses remain closed. Associated Press reporters Janet McConnaughey in New Orleans; Melinda Deslatte in Baton Rouge, Louisiana; Jeff Amy in Jackson, Mississippi; and Jay Reeves in Birmingham, Alabama, contributed to this story.